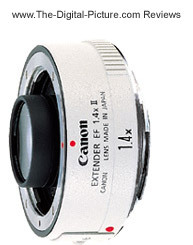 Note: The Canon EF 1.4x II Extender has been replaced by the Canon EF 1.4x III Extender. The Canon EF 1.4x II Extender is an easy and very affordable way to noticeably extend the reach (focal length) of compatible Canon L Series lenses (and a few additional lenses). The Canon EF 1.4x II Extender mounts between the compatible lens and body, and multiplies the focal length settings of your lens by 1.4x. That's the good news - the bad news is the 1.4x decreases/narrows your lens' aperture setting by 1 stop. The lens aperture still opens to the same width, but the ratio of the aperture opening to the focal length is reduced - by 1 stop. For example, the Canon 1.4x makes a Canon EF 70-200mm f/2.8L IS Lens into a 98-280mm f/4 IS lens - and yes, IS still functions normally. A Canon EF 70-200mm f/4.0L Lens mounted over a 1.4x becomes a 98-280mm f/5.6 lens. A Canon EF 300mm f/2.8L IS Lens becomes a 420mm f/4 IS lens. Extenders do not affect the MFD (Minimum Focus Distance) of the lens they are mounted behind, thus the MM (Maximum Magnification) of the lens is also multiplied by 1.4x. Do you need more macro magnification from your Canon EF 180mm f/3.5L Lens? Add the Canon EF 1.4x II Extender to the setup for a 252mm 1.4:1 Macro lens. Because the Canon EF 1.4x II Extender is multiplying the aberrations/flaws of the lens it is mounted behind by 1.4x, there will be some degradation in image quality when using the 1.4x. Sharpness (especially in the corners) and contrast are modestly reduced - stopping down shows lens degradation. However, barrel distortion causes the center portion of the image to be slightly enlarged (making it appear to resolve more detail). A noticeable additional amount of CA (Chromatic Aberration) is introduced, but vignetting is somewhat reduced (only using the center of the image). The best 1.4x results will be made using a very sharp lens such as the Canon EF 300mm f/2.8L IS USM Lens. Another negative aspect to shooting with the Canon EF 1.4x II Extender attached is the resulting reduction in autofocus speed. This can be an issue if you are shooting in low light and/or are using a lens that is not very fast focusing (such as the Canon 180 L lens mentioned above). Though most compatible lenses have widest apertures of at least f/4, some of the longer ones have an f/5.6 native maximum aperture. Since most non-1-Series Canon camera bodies need a minimum wide open aperture setting of f/5.6 for autofocus to work, only Canon 1-Series camera bodies will autofocus these f/8 1.4x combinations. The Canon EOS-1D X also requires f/5.6. The lens and extender combo can always be used in manual focus mode. A narrow maximum wide aperture creates a dark viewfinder that makes manual focusing even harder. Some people are reporting that the pins on the extender can be covered with tape to trick the camera into autofocusing. The Canon EF 1.4x II Extender is small and light. It is weather-sealed when used with similarly-sealed lenses and camera bodies. Build quality is excellent - Canon L Lens quality. 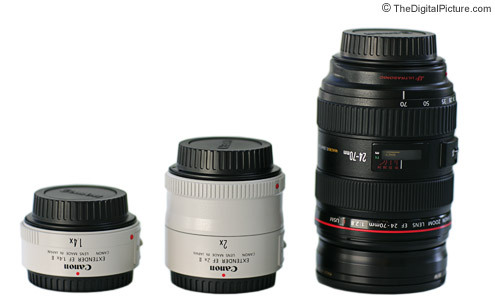 Pictured above from left to right are the Canon Extender EF 1.4x Converter, Canon Extender EF 2x Converter and the Canon 24-70mm f/2.8L USM Lens. The 24-70 L is shown for size comparison only - it is not compatible with the 2x. Please note: While some third party extenders *may* work with Canon's non-extender-compatible lenses, attempting to mount a Canon extender on these same lenses may damage the rear lens element. Canon extenders simply do not fit behind the rear lens element on Canon's non-extender-compatible lenses. Only certain Canon lenses are compatible with the Canon EF 1.4x II Extender. As a rule, but subject to change, the compatible lenses include fixed focal length L lenses 135mm and longer, zoom L lenses at least 70mm on their wide end and Canon TS-E Tilt-Shift lenses. My advice is to use the Canon EF 1.4x II Extender to extend the usefulness of a sharp lens that has another more primary purpose. Said another way, you generally will get better results from a 300mm lens than with a 200mm lens + the Canon EF 1.4x II Extender. The native lens is slightly less trouble to mount and dismount as well. The 1.4x is also useful in creating a longer focal length lens than is available natively. For example, a Canon 600mm f/4L IS USM Lens + 1.4x results in a 840mm f/5.6 IS lens. Buying a 1.4x over a longer lens for financial reasons also can make sense. To see examples of the image quality difference between a bare lens and a lens with the 1.4x attached, try the ISO 12233 resolution chart sample crop comparison tool. The link will set you up with an example mouse-over comparison of a best-case wide open scenario, but you can select your own lenses and apertures to compare. The Canon EF 1.4x II Extender - extending the reach of your very sharp and compatible Canon lenses for a low cost.